Jennifer Lawrence - "Winter's Bone"
Carey Mulligan - "Never Let Me Go"
Natalie Portman - "Black Swan"
Haillee Steinfeld - "True Grit"
Michelle Williams - "Blue Valentine"
I bet she won by a landslide. an incredible performance. She did. And it is. She will never top this. 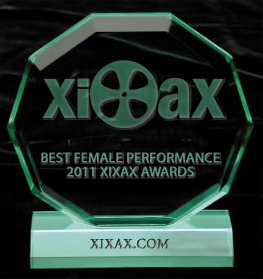 Now that she's a xixax award winner is she more likely or less likely to take it all off now?